We hear a great deal about California's reliance on its "frozen reservoir," a reference to the (currently anemic) Sierra snowpack. We hear a lot less about the Golden State's invisible reservoir, the water that resides in underground aquifers beneath our feet. That's about to change. Today, state Sen. Fran Pavley (D-Agoura Hills) puts a trio of water conservation bills before her Natural Resources and Water Committee, the centerpiece of which (SB 1168) is a frontal assault on the management of California's groundwater, which, compared to other western states, is almost unregulated. The current drought appears to be putting a new level of pressure on the groundwater debate. Cutbacks in state and federal water allocations have unleashed a drilling frenzy for water wells, and parts of the San Joaquin Valley are actually sinking from groundwater depletion below. 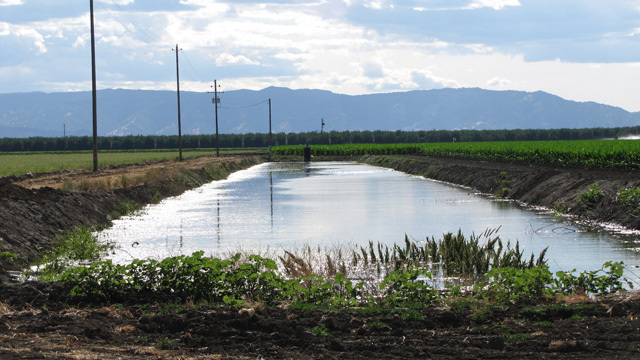 "The single most critical element in achieving [water] sustainability in California is groundwater," Lester Snow told members of the State Water Resources Control Board at a hearing last week. Snow would know. For years he was the state's chief water manager and now heads the relatively new California Water Foundation, a non-profit devoted, as he describes it, to "achieving sustainable water management" in the state. 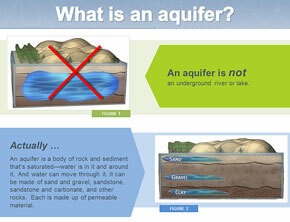 So what, exactly, is an aquifer? Click image to see full infographic. In a good year, which is to say "wet," Snow says that groundwater provides about 40 percent of the state's water supply. In dry years, like this one, we lean on aquifers for 60 percent of our water (up from 40 percent as recently as 2 to 3 years ago). "Effectively managed, it is the single biggest mechanism that gives us the flexibility to deal with the vagaries of our water system in California," said Snow. "And if we can not get our hands around that, we will not have a sustainable water supply." But some, especially in farm country, are more than a little spooked by what getting our hands around it might entail. If you want to see farmers and ranchers turn ornery, make like you're a state bureaucrat going after their water -- or their right to pump as much as they need out of the ground. So as the battle lines begin to form, here are some key points. California is the only western state that doesn't exercise some degree of control over its groundwater. But how much control is too much? Matt Conant, a walnut grower in Sutter County, articulated the greatest fear of many in the ag community: "I'm afraid that the state will come in and try to over-regulate groundwater and surface water," he told me outside a recent hearing of the State Water Resources Control Board. But David Orth, who sits on the groundwater task force at the Association of California Water Agencies, says leaving it entirely in local hands may not be enough, especially when local and regional agencies are falling down on the job. "In those instances, we believe the state board should step in," says Orth. "It creates, frankly, some bit of incentive for the locals to get together and get it right." That's a fairly bold statement, coming from an organization that has, in the past, taken a firm stand against groundwater regulation. But Orth says times are changing. "A year ago it was, 'This is mine and I don't want anybody to mess with my personal property right,'" he says. "Today, I think more and more people are recognizing that we have a choice; we can either let this continue to be managed in a somewhat insufficient way in some regions and see significant economic loss, or we can more effectively manage it and do so in coordination with the state, so we can protect that groundwater resource for decades to come." There's a growing chorus insisting that whatever else happens, we need better data, to know what's going on with our aquifers. Presently there is no coordinated tracking of aquifer health or the volume of water being pumped. Drillers file well completion reports, which can only be accessed by public agencies "conducting studies," according to state law. But there is precious little information available on how much water those wells are producing. Conant told me that farmers know from their wells, what's going on underground. But no one else really does, though scientists have been trying to piece together the big picture with a combination of monitoring wells and satellites that measure ground density. And once the data is gathered for what individual landowners are pumping, who should have access to it? Should it remain on confidential file with public agencies or be available to anyone? Then there's perhaps the thorniest question of all: whether farmers should pay for water that resides naturally under their own property. They're already paying for the energy required to pump it to the surface. But now the water wonks are freely tossing around terms like "tiered pricing" and "groundwater management fees." These are theoretical administrative charges to property owners, possibly based on how much groundwater they pump. But the regulators can't make this happen themselves. These ideas will have to coalesce into a groundwater bill that lawmakers can make stick. The current version of the Pavley bill contains a definition of "sustainability" but leaves it up to local districts to determine the volume of groundwater pumping that is sustainable in each are. Despite the lingering uncertainties, even some water policy insiders have expressed surprise at what Jonas Minton of the Planning and Conservation League calls, the "unprecedented consensus" on a possible approach to groundwater management. At that state hearing last week, he pronounced, "This is the year to do it."